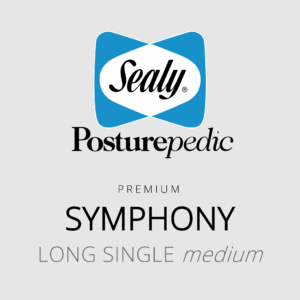 The Sealy Posturepedic Premium (Symphony) long single mattress in medium feel is the next level of luxury and support. The Sealy Premium range features exclusive Sense & Respond Technology, designed to sense the body’s weight and respond with the appropriate level of support. Sealy’s one-of-a-kind support system is strong, resilient and durable. It delivers initial soft response and firmer deep down support with each column of coils alternating for maximum stability – minimising lateral movement. 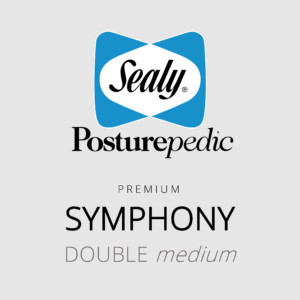 The Sealy Posturepedic Premium (Symphony) double mattress in medium feel is the next level of luxury and support. The Sealy Premium range features exclusive Sense & Respond Technology, designed to sense the body’s weight and respond with the appropriate level of support. Sealy’s one-of-a-kind support system is strong, resilient and durable. It delivers initial soft response and firmer deep down support with each column of coils alternating for maximum stability – minimising lateral movement. The Sealy Posturepedic Premium (Symphony) queen mattress in medium feel is the next level of luxury and support. 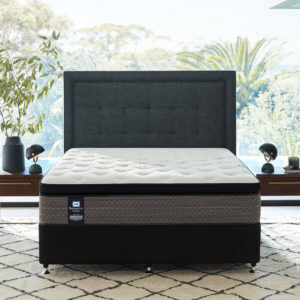 The Sealy Premium range features exclusive Sense & Respond Technology, designed to sense the body’s weight and respond with the appropriate level of support. Sealy’s one-of-a-kind support system is strong, resilient and durable. It delivers initial soft response and firmer deep down support with each column of coils alternating for maximum stability – minimising lateral movement. The Sealy Posturepedic Premium (Symphony) king mattress in medium feel is the next level of luxury and support. The Sealy Premium range features exclusive Sense & Respond Technology, designed to sense the body’s weight and respond with the appropriate level of support. Sealy’s one-of-a-kind support system is strong, resilient and durable. It delivers initial soft response and firmer deep down support with each column of coils alternating for maximum stability – minimising lateral movement.